Let’s just say it wasn’t the first time the State Capitol has been a site where small groups hastily assembled overly complex solutions to fix insignificant or non-existent problems. But this time was more fun. 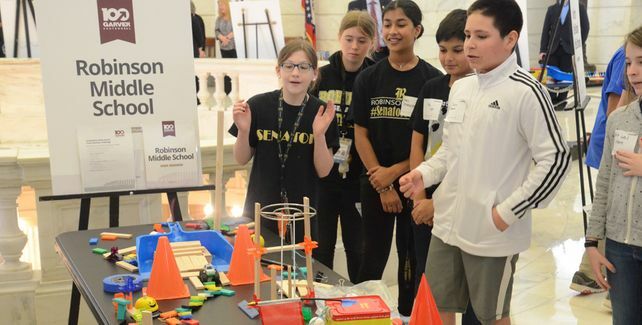 Students from eight Arkansas middle schools competed Monday (April 8) in the Capitol Rotunda in the Garver Chain Reaction Challenge. The teams each had been given STEM (Science, Technology, Engineering, Math) kits to use in the challenge. The kits came with wooden planks, balls, ramps and other items and were used to create a Rube Goldberg-style chain reaction. Rube Goldberg contraptions ingeniously accomplish simple tasks using unnecessarily complicated methods. At the Capitol, the teams along with their kits were given a mystery box composed of a pulley, plastic lemon, jack-in-the-box and a plunger. Then they were given 30 minutes to build their contraption. Beebe Middle School won the trophy, which was based on innovation, teamwork, duration and perseverance. North Little Rock-based Garver was formed in 1919 in downtown Little Rock by engineer Neal Garver and has grown to 600 employees in 28 offices in 11 states. It is celebrating its 100th anniversary by providing Garver Chain Reaction Challenge STEM kits and monetary donations to 100 schools in the various states within its footprint. Forty-three of those schools are in Arkansas. Garver CEO Dan Williams said the event is meant to introduce students to engineering principles so they can consider it as a career field. The firm will employ almost 60 college interns this summer, mostly to expose them to Garver. He said his firm has “well over 100” engineering openings. Hutchinson told participants that his six-foot-seven-inch grandson had shown no interest in computer coding in high school, instead relying on his basketball skills. He did receive an athletic scholarship, but he found in college that he didn’t like his business major. Now he’s majoring in computer science.